One of the most common of unused Beatles concert tickets. The 7:30 pm show, with 11,000 unsold tickets, still drew a crowd of 45,000 and grossed $292,000 - netting the Beatles almost $190,000. Most of the unsold tickets were originally discarded, but a few years ago promoter Sid Bernstein discovered 2400 tickets locked away in his vault with other entertainment memorabilia that he had collected since the 1960's. Some of the tickets were professionally framed with a color miniature poster of the ad for the 1966 show, and a certificate was attached to the back, individually signed by Sid. 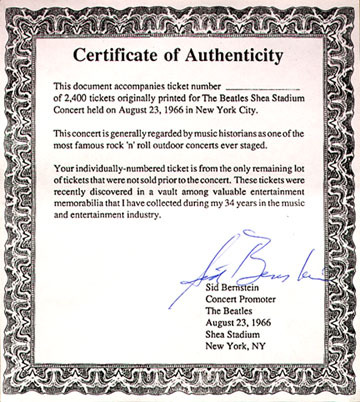 Note that the certificate states "This concert is generally regarded by music historians as one of the most famous rock 'n' roll indoor concerts ever staged" - we and others would have to strongly disagree, as this statement more accurately describes their classic 1965 show, which was an exciting event for the boys as well as the entire world. The '66 followup performance was not nearly as spirited and far less energetic, considering the controversy concerning John's religious remarks as well as their generally "burnt out" moods. Furthermore, the '66 show was 11,000 seats shy of the sellout crowd that was at the '65 concert. Although similar in appearance, original unused tickets for the 1965 show are MUCH more valuable and FAR rarer than the '66 tickets, with mint copies selling for close to $2,500.00. The '65 ticket features Rain Check information on the back whereas the '66 ticket does not.